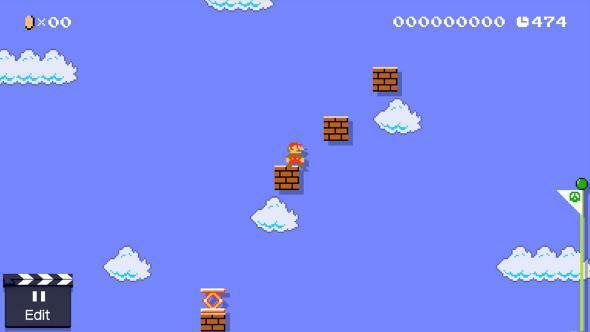 Super Mario Maker: It’s not just about building your own Mario levels. It’s about deepening your love of an art form. Paint. Learn Piano. Build Mario Levels! Super Mario Maker isn’t just about creating your own video game. It’s about deepening your love of an art form. Sophomoric sarcasm masquerading as game design in Super Mario Maker. I want to design a level in which Mario can only jump once. Not like one of those “automatic” levels you may have seen on YouTube in the past few weeks, ones in which Mario is bounced, conveyor-belted, and skull-platformed to the end as the player does nothing at all. I want my level to be a light hike: demanding engagement, but also fostering contemplation. The idea came to me as I sat in traffic on the 405 freeway, ruminating on level design and how to make a statement with verticals. But now that I’ve begun bringing my one-jump concept into being, I cannot—cannot—get the first and only power-up mushroom in the right place. I’m this close to giving up on the whole thing. These are the challenges presented by Super Mario Maker, which came out for Nintendo’s Wii U console earlier this month. You may have heard of it, whether or not you play video games: The reviews have been good to ecstatic, and YouTube is currently blowing up with user-generated content from the game. It’s all part of the hoopla surrounding the 30th anniversary of Super Mario Bros., the seminal Nintendo platformer starring a plumber, the pointy-toothed Goombas he stomps on, and a princess who’s always in the next flippin’ castle. 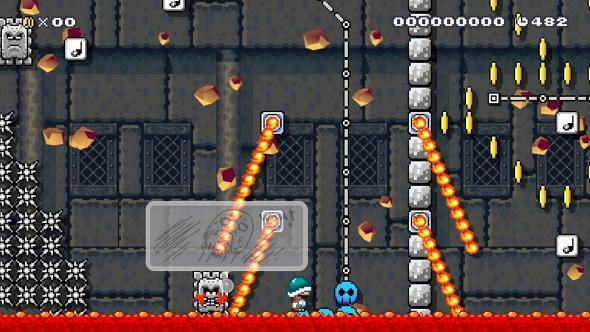 Half of Super Mario Maker is a lovingly designed level editor. The “player” is given a streamlined, easy-to-use toolkit and invited to create his or her own levels for Nintendo’s iconic plumber, choosing between the styles of various games Mario has starred in over the years. The other half of Super Mario Maker is a social platform that lets players actually play, rate, and comment on levels created by other players, as well some made by professional game designers. Nintendo’s strategy is savvy: Piggybacking on Mario’s widespread appeal, Super Mario Maker exploits our fascination with sharing and rating to generate publicity for all things Nintendo whenever anyone throws some blocks and some Koopas together and shares his or her work with the world. And anyone can do it. This is, in fact, kind of the point. In this level, you choose to enter the “cursed house”; it’s spooky, making that choice. Maybe the ghosts are really inside of you. User-generated content in gaming isn’t new. Nor is it novel, at this point, to argue that video games are an art form, a medium through which creators channel beauty and ideas. What’s significant about Super Mario Maker is how it has combined these two facts—players’ creative impulses and the legitimacy of game creation—to unleash a pent-up profusion of vernacular experimentation and dialogue. It has opened up the practice, tools, and principles of an art, through the lens of the most well-known characters in the industry. Two-year-olds are trying it! You know what else 2-year-olds often try? Painting. Violin. Making stories. Not because we, as a society, are necessarily trying to drive 2-year-olds into the creative arts, but because those kids are inheritors of a rich legacy of various cultural forms, and understanding the practice, tools, and principles of those forms will enrich their access to that legacy. It doesn’t matter if they become lawyers, baristas, or yogis: Trying to do an art is edifying in itself and enhances the experience of it ever after. For example, one of the nicest things about being a fiction writer—there are a couple nice things about it—is that people know what my core work entails. They may be mystified by the peripheral fussiness of agents, submissions, and publication (I am, too), but any lawyer or barista who enjoyed a solid primary and secondary education has written, and not just term papers. They also may have tried music or the visual arts. Maybe they stunk at them; maybe they excelled. But they tried, and the impact of this is manifest in them as readers and listeners and museum-goers forever. So when they find themselves in conversation with some feckless ne’er-do-well who spends his days at a standing desk making up stories, they’re often pleased to discuss, in surprisingly technical detail, what storytelling mechanics tripped him up that day. An “automatic level”—just sit back and watch—from one of the Super Mario Maker community’s highest-ranked makers. Super Mario Maker takes this component of our culture’s relationship to other big creative formats—hey, try making some—and applies it to video games. Predictably, the results are magnificent and varied; people are backlashing and back-backlashing about levels created by others, levels that run the gamut from inspired to sadistic (too many to link, honestly) to inspired and sadistic. We’ll all have our preferences (enough automatic levels, people). That’s the point. At the same time, the game has provoked a spirited mainstream conversation about game design. Super Mario Maker has already given hundreds of thousands of people an object lesson in why Level 1-1 of the original Super Mario Bros. is an outrageous masterpiece—a discussion formerly limited to, if not experts, people rather far along the bell curve of gaming nous. The key theme that emerges is straightforward: Game design, like all art, is hard. That’s sure been my experience. Like a teenager whose technical limitations tether the heart-scope of his notebook poetry, I’ve made levels so far that are smirking exercises in hollow formalism. My personal favorite is “why r u jumping on these blocks?” in which … well, you probably get it. (If not, don’t worry. Really.) Design in Super Mario Maker is itself a tactile treat You use a touch-screen controller, integral to the Wii U’s interface, to move various recognizable game elements (bricks, Goombas, conveyor belts) around a gridded-out screen; you can combine some elements and twirl others about, prompting them to transform (green Koopa Troopas turn to red ones, for instance). The sound design features an Auto-Tuned voice, announcing your actions to the melody of the franchise’s familiar music. What I’m stuck on in “Keep Cool, Fool,” that one-jump stage I thought up on the 405, is momentum: How to teach the player the pace at which she’s meant to do something that ought to be simple—run forward. It’s not. And after I figure out how to convey that basic aspect of the experience through the placement of blocks and flying turtles, I’ll need to figure out how to actually make a game of the thing. In this, I’m one of thousands and thousands taking satisfaction, without any notion of being anything but terrible at it, in learning the principles of a form: Use spatial positioning to teach the player the “game” of an encounter; tier difficulty so that the challenge is pleasurable; shape levels around thematic play, not just visual motifs; don’t just throw everything in there. These are principles of practice like the basics of shot composition in cinema, like the writer’s axiom to “show, don’t tell.” And even if very few of us end up as film directors or fiction writers, contact with these principles builds and deepens our appreciation of whole categories of creativity. Whatever their profession, many people share a felt knowledge that Toni Morrison and Stephen King do a craft that is valuable and defined, a craft that is a legacy of ourselves and our brains’ capabilities and has evolved over time. We all have the capacity to be creators, making things for others to experience, according to a guiding set of principles that are fluid but nonetheless real. Spending time on both sides—creator, consumer—improves us, whoever we are. Super Mario Maker is an oddball release: In a somewhat grumpy take, Wired’s Michael Rundle calls it “a level making app masquerading as a video game” and concludes that it leaves the “true genius of this series … just as distant from being explicable to regular humans as ever.” I agree—and I think that’s great. 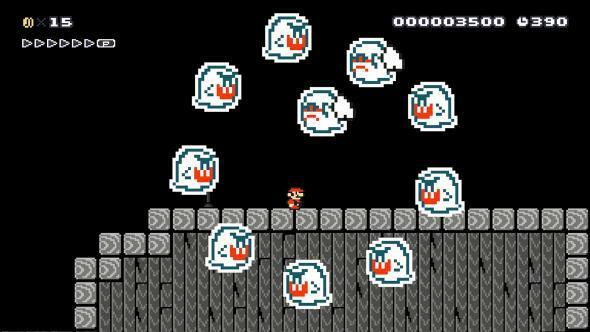 Super Mario Maker is overdue and welcome, particularly since most of us are so lousy at it. It teaches us what a game is, and what making a game is, in an accessible and inviting way. It’s a video game that unlocks the pleasure of the whole form, a pleasure that comes only with practice and a taste—even just a taste—of creation.